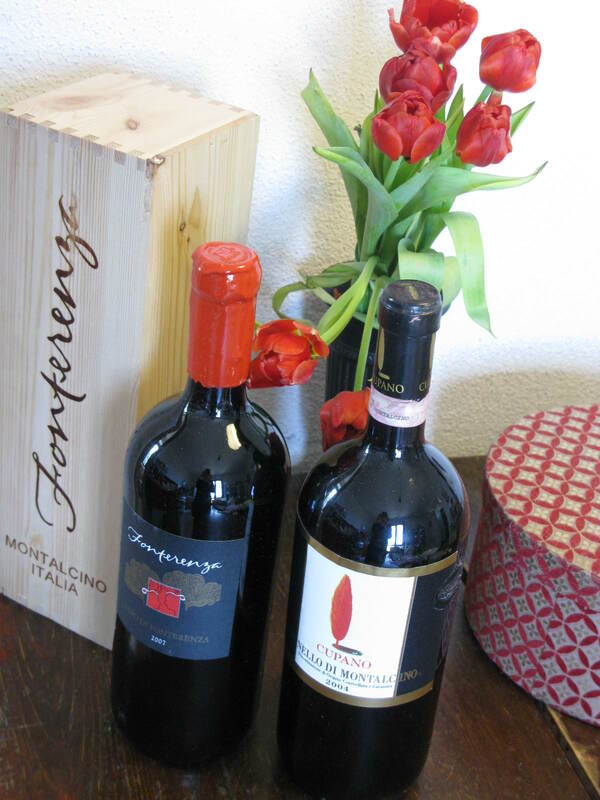 Still life with magnums of Fonterenza and Cupano. With some things it's either yes or no. If you're feeling incredibly passionate about Italian wine, then the Benvenuto Brunello wine fair in Montalcino is a must. If you rather taste that glass of Tuscan red in quiet contemplation, then Benvenuto Brunello is a no-go. Not the type to shy away from a wine crazy crowd? Come dressed well (it's cold and windy this February in Tuscany) and beware of the wine aficionados all over the place. Journalists, wine buyers and restaurant owners battle their way through the crowd to taste as many as possible of the newly released Brunello 2007 (a five star vintage!) in the midst of locals and non-locals. Yeah, right. So didn't I just pass my sheep farming neighbor? And isn't that an American tourist standing on my new winter boots right now? The over 200 wine estates in Montalcino have plenty of invitations that they generously share, if you show some sincere interest. Choose one of my favorite wine estates in Montalcino for a private visit, buy a few bottles and then ask nicely whether there's any way to attend the fair... See you there. And don't you dare using those elbows. I know the Italians do, but hey, they are on home territory. And I promise: there's enough Brunello 2007 out there for everybody. WHEN: From Friday 24th (journalists only) to Monday 27th of February 2012. Details on the exact timing can be found on the Consorzio's webpage. WHERE: Check the Consorzio del Vino Brunello di Montalcino's detailed map for the event. There are various locations set up in town for the tastings (don't miss out on lovely Palazzo Pieri and the beautiful cloister of Montalcino's museum). And err, parking is a nightmare. So wear boots comfortable enough to walk a couple of miles.